Despite it being colder than a drunk polar bears foot on Saturday night I went out to Live on Light Square to cover a gig called Playin’ UP. 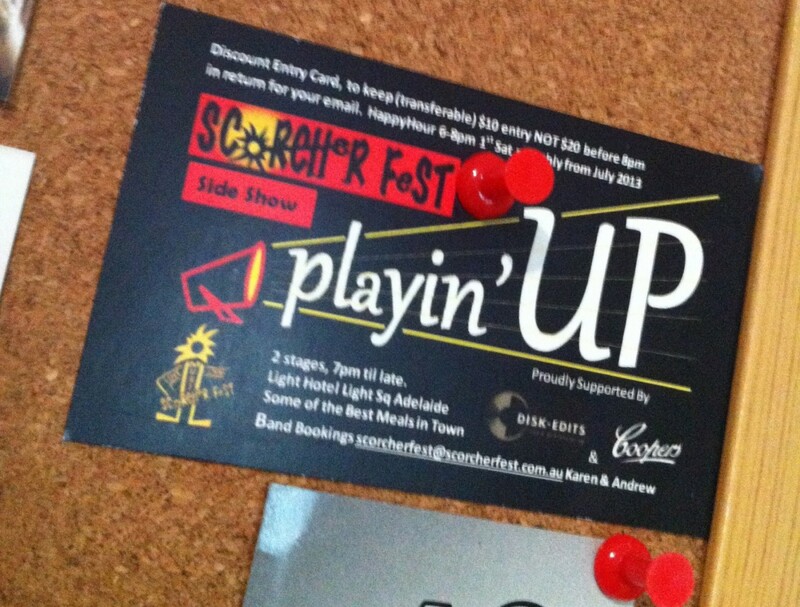 This show is an initiative of the guy who organised Scorcherfest, which I went to a little while back. The idea in itself is a really great one – A recurring gig on the first Saturday night of every month featuring twelve live bands across two stages. The show runs from 7:00pm till late and there’s also a lot of potential for this to become a great launching spot for Adelaide bands if it continues to run and the proceedings of the night can to be shaped into a well-oiled machine. The only problem here is that these kinds of things tend to run into the ground when there aren’t enough people walking through the doors. It really disappoints me that there isn’t as much fuel behind live bands these days. The door price was $20, and those who nabbed a membership card can return on subsequent nights for $10 before 8:00pm. In my eyes this puts the bands playing later on at a disadvantage, as their friends must either come early and wait around, or come later on and give up a tasty twenty-dollar bill. In effect people should be stoked for all the bands. Anyway, as much as I can rant about the state of Adelaide’s nightlife I should probably mention the bands that gave a ripper performance! I rocked up to the bar closer to 9:00pm and was a little riffled that I had missed out on my half price entry, so I gave up my tasty red twenty and hopped up the stairwell where I caught Escapism, who are basically some flanny-clad lads shaking out some heavy riff-centric blues. The overall style of the band is something that I love; yet some unintentional irony was brought forth by the lyrics when I took myself away from judging the drummer. It’s hard not to do that. It’s hard okay. I think from my perspective if they had anything to focus upon it would be refining their stage presence and balancing of the vocal range to make it more dynamic. The next band I thought were worth mentioning were called Lucid Dream. I feel bad that I let my inquisitive nature fall short on Saturday night because I was feeling pretty freezing and that put me in this sodden mood where I became a reclusive hermit – usually I talk to all the bands I saw! But man these guys were funky as all hell, they were a three piece, and this let each instrument be well interpreted though the mix. Their style was also very distinct and spacy. I definitely really enjoyed it! It would be great to see more people come to an event like this, and I’m hoping to do some work with the organiser to get things like door-lists and maybe even something like an amp vs. amp battle going!